Patrick and I often find ourselves turning to our bamboo cutting board whenever we need an impromptu casual platter. It's really the best of both worlds - for utility purposes, you can prep on the board and then bring it right out of the kitchen for serving and for aesthetic purposes, you'll find that the bamboo elevates your presentation of said simply prepped ingredients. 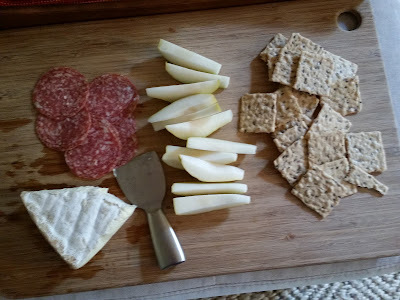 In the past two weeks we've used our bamboo cutting boards as snack / luncheon platters. Last weekend we had friends coming into town and were pit stopping at our house before continuing to their hotel. They were arriving around 4pm and I thought to have something on hand for them when they got here would be a good idea. I picked up a brie wedge and had the rest on hand - sliced salami, pear, and crackers. Slicing the pear required the most work here since I placed a cheese knife with the brie and made everything serve yourself! After the pear was sliced and the cutting board assembled I brought it to the living room and set it on the ottoman so we could all chat and relax on the sofa. Perfect! Then last weekend Patrick and I had a nice brunch at the house and with plans to fix dinner we turned to the pantry to put together an antipasti platter for lunch. I had picked up salami at the grocery store that day and everything else was from the refrigerator or pantry. 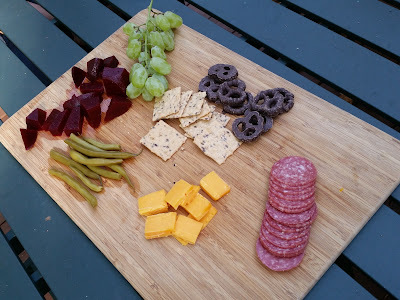 There were pickled beets, crackers, dark chocolate covered pretzels, salami, cheddar cheese slices, and dilly beans. We've always enjoyed keeping fruit and cheese on hand for afternoon snacks but now I'm also making more of an effort to have more substantial items for us. We typically have "snack-y" lunches on the weekend and this is a great way to do that. For this particular lunch we picked up the bamboo board and headed outside! It was a gorgeous fall day and it was nice to sit outside and enjoy each other's company over a simple lunch.